I have a fully functional lab with ESXi and vCenter, entirely built based on the access network (VLAN 1). That’s why I could not completely get rid of this network (re-addressing is not an option), especially since all my home infrastructure is integrated with services running there (eg. DNS server). 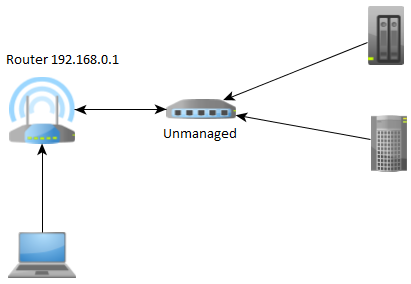 Old configuration consisted of a IPS router and unmanaged L2 switch. 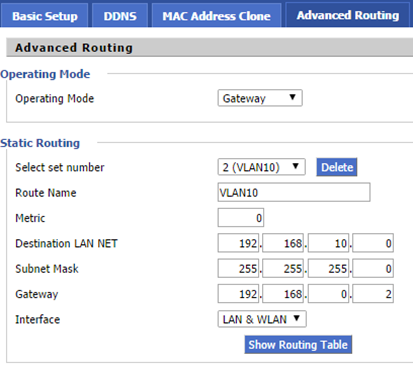 Gateway address for the LAN is the old address of the ISP router from the 192.168.0.0 network, in addition to start the DHCP server from which the Cisco switch will get its own IP address. And now, most importantly, devices in the internal network get access to the Internet (external network). We need to configure additional static route (basic supports 192.168.0.0) network other than the internal router leading to the ISP. 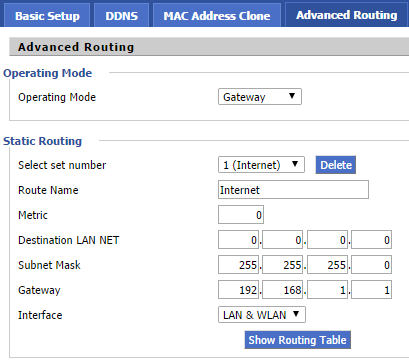 Gateway is a new ISP router address 192.168.1.1 after migration (described at the end). 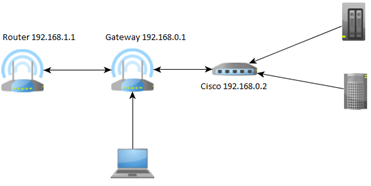 In addition, for each vlan network we need to do a separate static route indicating the address of Cisco to which it is hooked gateway (D-Link). Without this traffic from the external network will not return to the internal. Of course, for services such as port forwarding we are doing configuration at the level of DD-WRT (Gateway), at the ISP (Router) such a redirection must be removed (not only will not work, but block the communication). And all this on the DD-WRT. 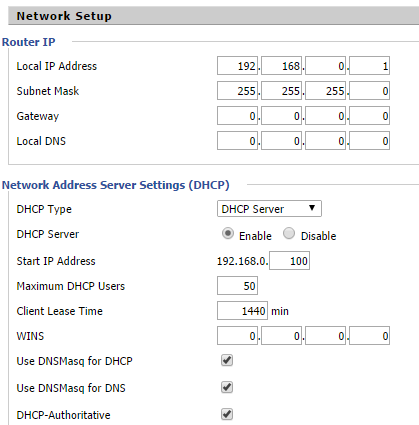 We will now proceed to Cisco which is connected to the DD-WRT, Cisco gets the address from the DHCP log with login cisco and password cisco. In the first step we have to switch the mode from L2 to L3 (switch will restart a previous configuration is erased). Remember that the IP address that the switch downloaded from the DHCP become his primary address (permanent). His change is possible only with the console accessible via serial cable (do not do this via the web or ssh). I describe here only the configuration of these parameters, which are related to the topic of the post, in the configuration, you can still have a lot of other things to change. 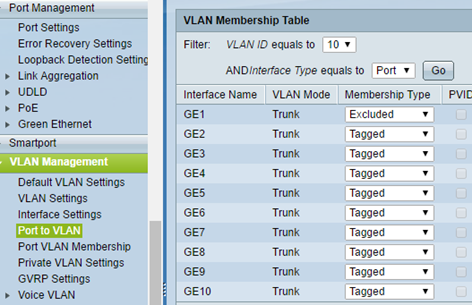 On the VLAN ID set any VLAN, but do not change the default VLAN 1. 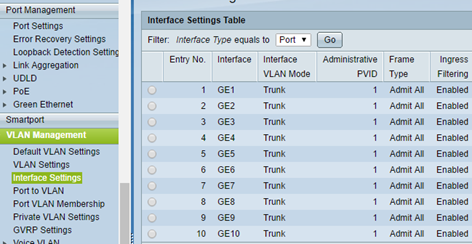 All ports VLAN Mode should be set to Trunk and it does not matter that we will mix settings. 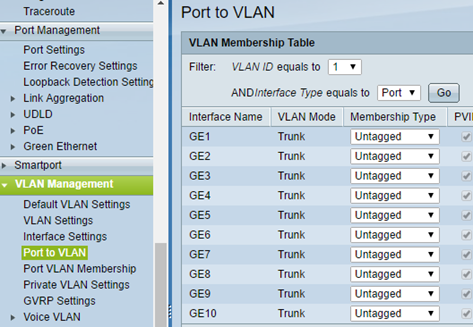 In the Port to VLAN assigns the TAG VLAN to the port. VLAN Membership 1 type is left as an Untagged. For each additional VLAN ID set Membership Type Tagged as bypassing the port 1 which will be hooked to Gateway (D-Link DIR-300). So should Port VLAN Membership look like this. In the IPv4 Interfaces we give IP addresses for each VLAN, these addresses will function as a gateway within the network. For VLAN1 address we set only from console. In the last step, set routing, Next Hop Router is the internal address from DD-WRT (D-Link). Other networks are routed internally. At this point, we can save the configuration of Cisco and activate. The process of switching the old network configuration to the new is extremely simple. 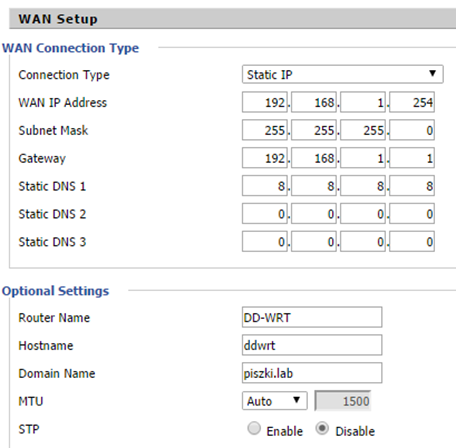 Repoints ISP router to 192.168.1.1 (remove all port forwarding rules and add DD-WRT to the DMZ). Connect the DD-WRT (WAN port) to the ISP router and all devices (eg. ESXi) repoint to Cisco. Everything should work without problems in the old access network 192.168.0.0 and additionally we ping the VLAN gateways.